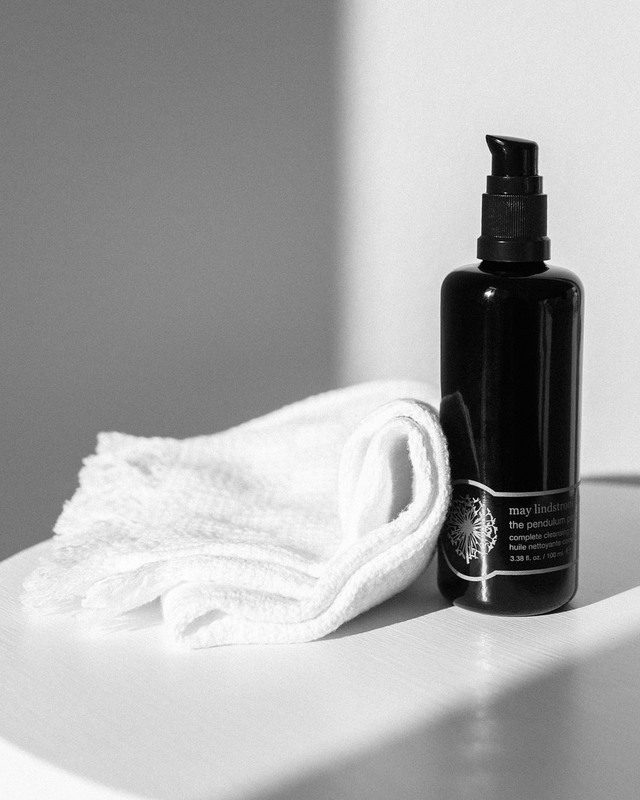 The cleansing oil by May Lindstrom Skin comes in a black glass jar that protects the oil from its greatest enemy: light. Instead of perfection, aim for self-acceptance. A true sense of worthiness makes you glow, and that feeling of worthiness starts by accepting and appreciating yourself just as you are. Photo credit: Craig McDean for Vogue, 1997. Unable to find a really good and simple cleansing oil, I began mixing my own last summer, using organic cold-pressed vegetable oils. My starting point was an angry yet sensitive skin with breakouts. That is probably why I did not feel comfortable putting almost anything on my face. It needed to calm down and rest, and oil cleansing became my number one beauty ritual for several weeks. Massaged onto face, oil dissolves dirt and impurities without affecting the skin’s natural barrier, the hydrolipidic layer, that protects the skin against infection, irritation, allergic reactions and dehydration. The method is simple and, for the first times I tried it, pretty groundbreaking. All you use is oil, your hands and a clean face towel – and what you get is the softest skin with its healthy color starting to return. Pour a small amount of oil on your palm and massage onto dry face and neck. Wet your hands with warm water and continue massaging for a minute or two. You will feel your skin warming up and softening. Wet a clean face towel with hot tap water, wring extra water out and cover your face and neck with the towel for a mini steam. Hold for a moment, then wipe your face gently with the damp towel. Rinse the towel again with hot water, wring, hold on face, wipe and repeat for a couple of times until skin is soft and cleansed. Follow with toner and moisturizer if you like. The brilliance of this method is how gently it clears irritations and blemishes. Make sure your towel is soft, use a clean towel every time, and avoid scrubbing. No matter what your skintype, after you have massaged the oil into the skin, and the pores are open from the steaming, gentle wiping is enough to clear out dirt, congestion and dull dead skin cells. A good cleansing oil is super easy to blend. I have experimented with different combinations of jojoba, camellia, tamanu, macadamia, olive, avocado and plum kernel oils. The same ingredients, plus some, can be found in the recently released Pendulum Potion cleansing oil by May Lindstrom that I also enjoy using. The thing about making my own cosmetics though, for me, has been similar to the thing about cooking my own food. I will never pay money for less-than-excellent skincare products again! When you simplify your beauty routine, when you begin paying attention to the ingredients you put onto your skin, and you do that mindfully, you get more results with less products. To test oil cleansing without investing in a bunch of stuff, add one drop of essential oil to one teaspoon of vegetable oil and follow the method described above. Lemon essential oil is clearing, lavender soothes inflammation.